I’ve recently discovered that I will always love and thoroughly enjoy cooking & inventing new things in the kitchen. Now, the only difference is that I have to incorporate what I make and eat into a new, healthier lifestyle. That doesn’t necessarily mean not eating that pasta dish that I love (because seriously, who could live without pasta), rather, finding fresh ways to make it healthier and eat less of it, for example, eating whole grain pasta instead of white, or incorporating more veggies into the dish. Also, lately, as a rule of thumb, I try to make sure that everything I eat “fits my macros,” meaning, before I eat anything, I ask myself the question, “will I be getting enough protein, fat and carbohydrates when I eat this [tray of sushi], or will I be getting too much?” I’ve had to adjust and have actually noticed a huge difference in the way I eat, because, as I’m sure you could guess, before I was getting WAY too many carbs and fats of the unhealthy kind, and not enough protein and healthy fats. With this shift of eating habits, I’ve been trying to think of new ways to make the dishes that I love, and still enjoy the process. A couple of months ago, I posted this photo on Instagram, and you guys seemed to really like it, and that’s great, because I did, too! I’ve made it so many times since that first photo, and it hits all the factors that I want and need; it’s not super unhealthy, it’s delicious and it’s nutritious. Booya. For a long time, I’ve wanted to start a cooking series in which I take “normal” recipes and switch them up, because, to be honest, that’s how I come up with half of the food that I eat daily. So, today is the day; I’m going to start my series, which I’ve aptly named “Recipe Remix” (oh, the cheese ;)), and I’m going to start with the recipe that I created the day I posted the picture. 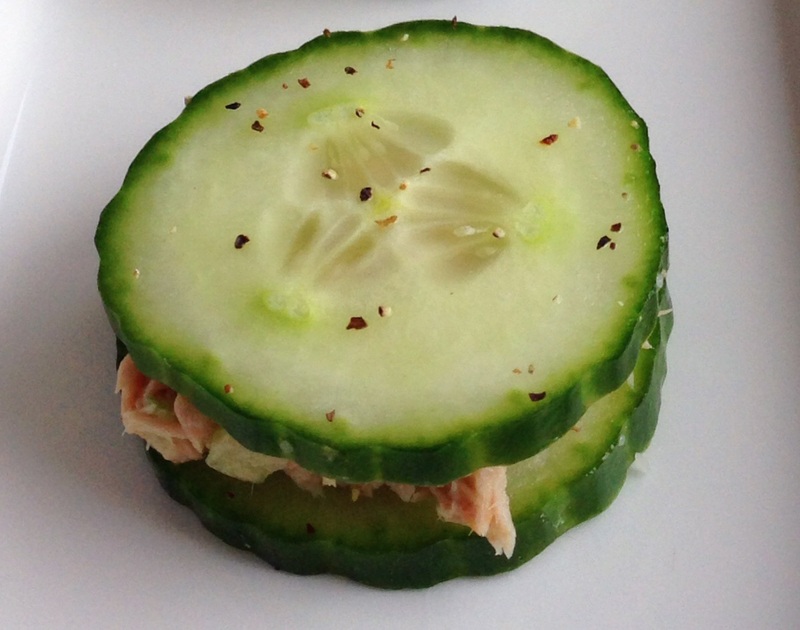 Ladies and gentlemen, I present to you: the new cucumber sandwich. These little wonders are so, so, sooooo tasty. 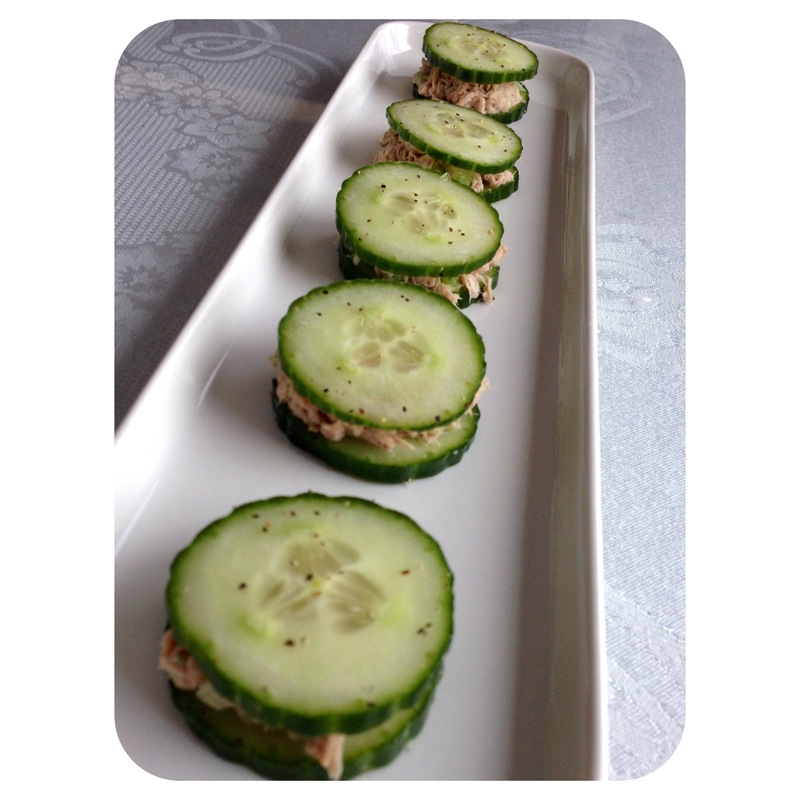 Instead of sandwiching some cucumber slices between two slices of bread, as cucumber sandwiches are traditionally made, why not swap the bread for cucumbers as a healthy subsititure and add some protein!? 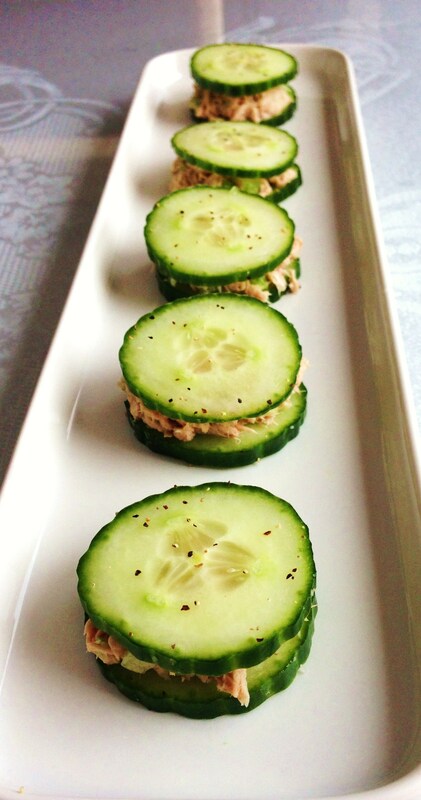 I’m already a huge fan of cucumbers, but in case you didn’t know, with the amount of great qualities in your average cucumber (they are 95% water, so they aid in digestion, weight loss, etc., they are a good source of vitamin C and B, and they feel marvellous on the eyes during in-home spa evenings ;)), no wonder they are considered a superfood! 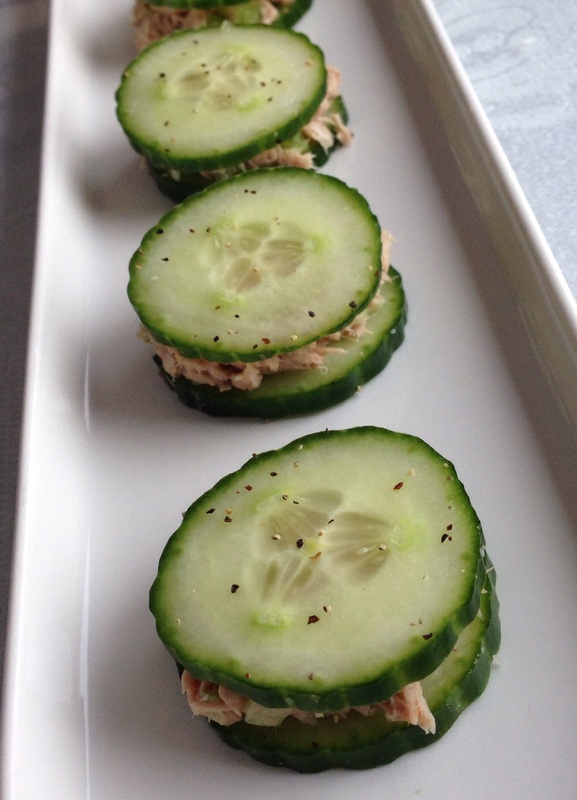 Plus, add the protein-packed tuna and yummy celery, with a few extras to whet your appetite, and you get one heck of a snack (or have a few more to make it a meal, I won’t tell :)). 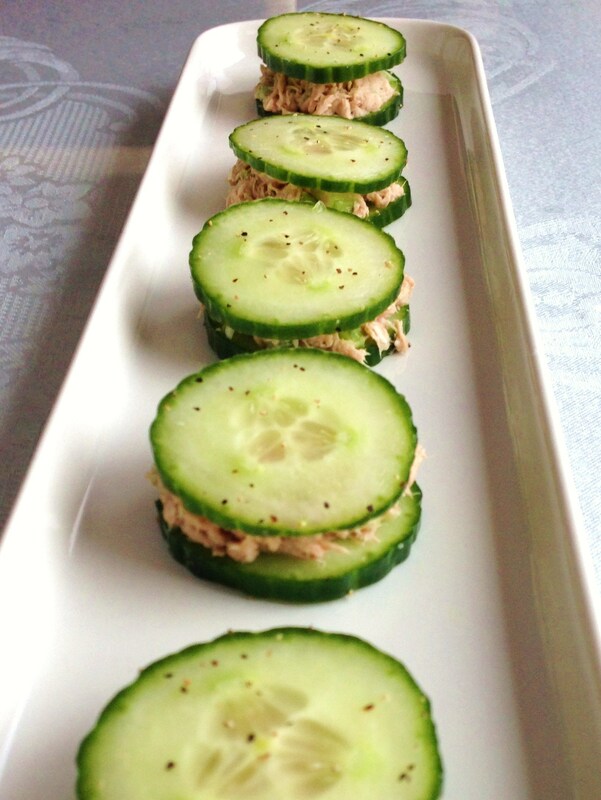 If you aren’t fond of tuna, feel free to substitute any kind of fish you like, or even chicken. 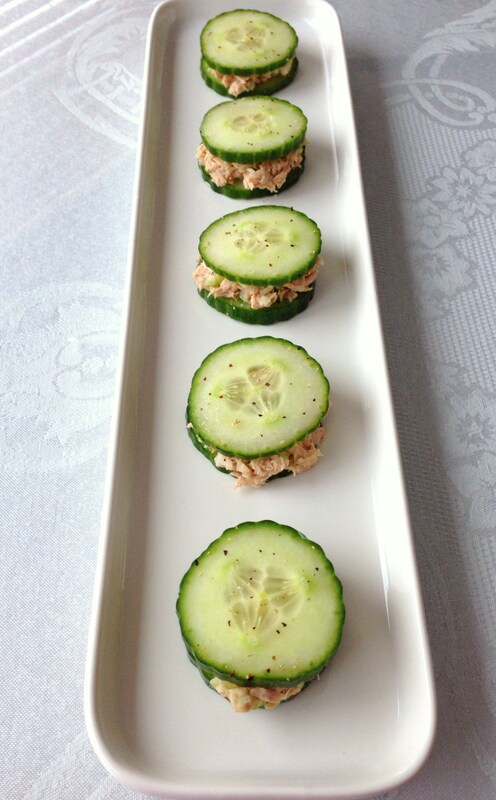 My preference tends to be tuna, though, and with the convenience of tuna in a can (I know, I know, BAD, but I always use the tuna in water so it’s not as fatty or unhealthy and double up on water to help compensate for the sodium & preservatives), I can whip some up in a flash (like, we’re talkin’ 10-15 minutes). Oh! Furthermore, these are awesome to have in the fridge for when you’ve had a busy day or just getting hangry, because they keep for a couple days and actually taste a bit better the day after initial preparation. Okay, okay, enough of the rambling, let’s get to the recipe! If you want to see a specific ingredient featured in this series, or you want me to remix one of your fave recipes, just let me know in the comments down below or drop me an email! Thank you so much for reading and have yourselves a fantastic evening, folks!